THESE CHINESE LINKING RINGS WILL BE SURE TO AMAZE! THE SECRET: For this trick you are going to need two metal rings, one with a small slot in the middle. Now you can buy a set of miniature Linking Rings in my shop or you can invest in full size ones, it's completely up to you whether you are performing close up or stage magic. TIP: Don't have the cash to splash on purchasing the Chinese Linking Rings? Why not make some by (carefully) bending some wire into shape. They do not even have to be circular. Why not squares? Fix one so that it is solid and leave one with a small gap. You can also buy less expensive plastic linking rings - but I prefer to work with the metal ones. SUBSCRIBER TIP: Here is a great tip from my subscriber David K: "I bought my rings at a fabric store. 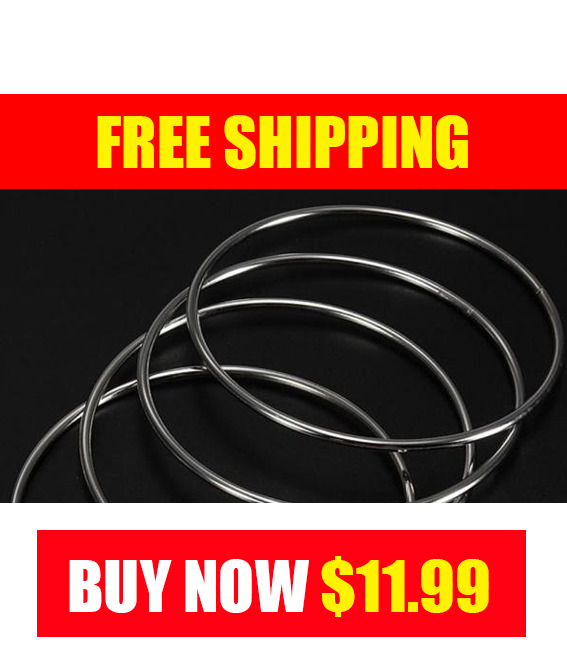 They have different size metal rings for far cheaper than online." (Excellent tip David!). Begin the trick with the two rings on the table. Overlap the solid ring over the ring with the gap, so the gap is hidden. Pick up both rings in each hand making sure that when you pick up the ring with the gap, you grip it between your fingers to hide it. Show both rings to your audience. Now the next moves are your 'convincer' moves to show the rings are solid without you having to actually spell it out. Place the solid ring over your right arm where it bends at the elbow. Hold the gimmicked ring (with gap in) up to your audience and pretend to turn it in your hands. Spectators will think they are seeing all the ring but in fact you keep the gap hidden at all times. Just pretend to turn the ring and let it slide through your hands (pic 1). When you have done this a couple of times (don't over do it) place the ring over your left arm where it bends at the elbow. Because your arm will be bent the gap in the ring will be hidden. You can now take the solid ring off your arm and give that a few turns to show it's solid too (pic 2). Bring both rings together (always hiding the gap in the ring between your thumb and pointer finger). Knock them together a few times then push the solid ring through the gap in the gimmicked ring. Do this while your pointer finger hides the gap from the audience. When you do this move you want to be as fluid as possible so it just looks like you are rubbing the rings together. Any jerking movements will look unnatural and awkward. 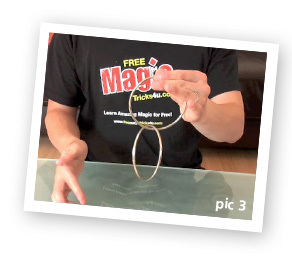 When you have performed the move let the solid ring drop and show it has magically linked with the other ring (pic 3). To get the ring back off again simply reverse the moves. As you unlink you can give a little magical blow and then separate them. Now that was maybe the simplest way to link them but I have a much more visual move to share with you. This move looks even more impressive if you get a spectator to hold the solid ring. 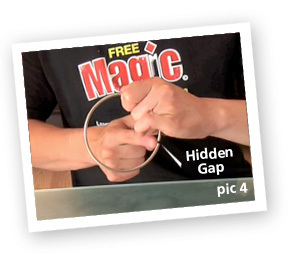 Grip the gimmicked ring in your fist so that the gap is touching your pinky finger (be careful not to flash the gap). (pic 4). Hold the solid ring in your hand or better still get a spectator to hold it. Tap the two rings together a few times then when you are ready to link them, bring the ring down and bend your writs so the gap comes down over the solid ring. As soon as it goes through bend your wrist back again. Now performed quickly it will look like metal has passed through metal. Be warned this can be a tricky move to pull off at first, you may begin by missing the gap and hitting metal on metal. Don't worry with a bit of practice you will get it. Finally simply perform the unlink move and you are back to normal. To finish the trick relatively clean just place the rings back on the table with the solid one overlapping the gap in the gimmick. Just make sure your spectators do not try and grab at the rings. You now know how to perform the classic Chinese Linking Rings!